William Gallas salvaged a draw for Arsenal with a last-gasp goal in their Champions League opener at Dynamo Kiev. Gallas poked in from point-blank range at the far post after a low cross from man-of-the-moment Theo Walcott. The goal cancelled out a harsh penalty for Kiev when Bacary Sagna was punished for bringing down Ognjen Vukojevic and Ismael Bangoura slotted in. Arsenal spurned a number of chances in the game and looked like they might pay the price before the equaliser. 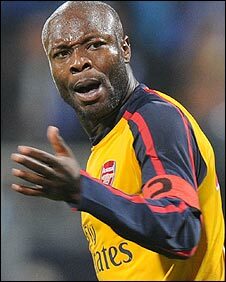 Gallas's 88th minute effort also saved an embarrassing defeat for Arsenal who have consistently struggled on trips to the former Soviet Union. Kiev had beaten the Gunners in 1998 and 2003 but have not won a Champions League game for four years, while they lost each of their six games in the competition last season. And, even though Arsenal's record did little to inspire, the visitors started passing the ball about with confidence and purpose. They worked an early chance when Walcott cut inside from the right flank and slid Van Persie through on goal. The Dutch striker's angled effort was blocked by keeper Stanislav Bogush during an opening period where Kiev appeared to give their rivals too much respect. What did you make of the game? The home side almost gifted the Gunners the lead when a Roman Eremenko backpass went straight to Adebayor. He evaded two defenders as he ran through on goal only to curl a 15-yard shot disappointingly wide. Although Kiev gradually improved, they got little change out of the visitors' defence as they lacked the creativeness to threaten a goal. Arsenal did have the flair and created a number of chances but were missing a clinical edge. Sagna pulled a low cross back to Van Persie at the near post and he could only find the side-netting with a powerful shot. Fabregas was next to spurn a gilt-edged opportunity as he latched on to a Van Persie knock back and should have done better than to bounce a shot straight into the keeper's arms from eight yards. Kiev almost punished Arsenal's profligacy after the break when Eremenko's angled drive came back off the near post before Almunia gathered. Arsenal were coming under more pressure and conceded a penalty which appeared more than generous in favour of Kiev. Vukojevic seemed to be doing as much pulling and pushing as Sagna at the far post but it was the Gunners right-back who was penalised. Bangoura nonchalantly rolled in the penalty to his right as he sent Manuel Almunia the wrong way. The already fervent crowd were sparked into a greater frenzy as they urged on their side. A now-inspired Kiev rode the wave of noise at the 17,000 capacity Valeriy Lobanovskyi stadium and Bangoura shot into the side-netting against a rattled Arsenal. But the visitors rescued a point when Gallas was on hand to equalise after Adebayor failed to get the telling touch to a Walcott cross. "The game is a mixture of frustration and relief. "Frustration because it was agame that should have been over at half-time as we created clear-cut chances. "It was relief as we were 1-0 down with three minutes to go. Our level dropped in the second half and we didn't create as many chances as we wanted." Dynamo Kiev: Bogush, Betao, Diakhate, Mykhalyk, Nesmachniy, Vukojevic, Yussuf (Asatiani 90), Yeremenko, Aliev, Ninkovic, Bangoura (Kravets 90). Subs Not Used: Shovkovskiy, Ghioane, Morozyuk, Shatskikh, Olexander Romanchuk. Booked: Nesmachniy, Bangoura, Vukojevic, Diakhate. Arsenal: Almunia, Sagna (Eboue 78), Toure, Gallas, Clichy, Walcott, Fabregas, Song Billong (Bendtner 70), Denilson, Van Persie (Vela 83), Adebayor. Subs Not Used: Fabianski, Ramsey, Wilshere, Djourou. Ref: Luis Medina Cantalejo (Spain). BBC Sport Player Rater man of the match: Theo Walcott on 7.42 (on 90 minutes).